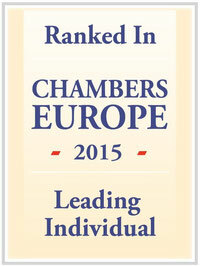 Founding and Managing Partner Andrea De Matteis has been recognised as a Leading Individual for his work in the field of Competition / European Law by Chambers & Partners in their 2015 Europe Guide. Andrea De Matteis of De Matteis Studio Legale focuses on the areas of electronic payments and data protection within competition law, and is increasingly recognised for his robust litigation skills: "He is extremely effective in court matters and litigation – he's unafraid to go to court and has been successful on numerous occasions." Chambers & Partners is one of the most important independent research companies focused purely on the international legal sector. They have been ranking the best law firms and lawyers since 1990, and now cover 185 jurisdictions throughout the world.